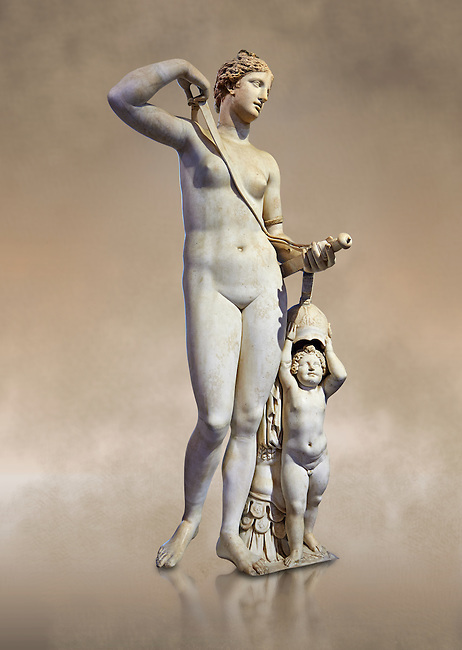 Venus (Aphrodite) in Arms. A 2nd century AD marble Roman statue completed in the 16th century. The so called Venus in Arms shows Venus with a sword and armour accompanied by a cupid that is about to try on her oversized helmet. The statue belonged to the collection of Tiberio Ceuli, purchased by Cardinal Scipione Borghese (1576-1623) in 1607. The Roman head does not seem to belong to the statue. It graced one niche of the living room of the Villa Borghese. Borghese collection, Inv No. MR. 373 (Usual No Ma 370), Louvre Museum, Paris.